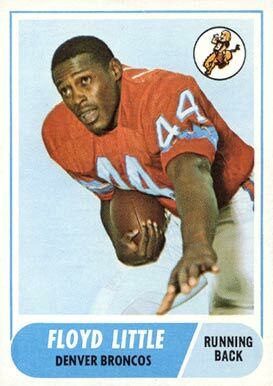 1968 Topps football card of former pro football running back Floyd Little, who was a star player for the Denver Broncos during some of their lean years in the old American Football League. He played 9 seasons for the Broncos and was a two-time AFL All Star, then carried that success into the NFL after the leagues merged, being named to the Pro Bowl 3 times. Little was elected to the Pro Football Hall of Fame in 2010. Little was all-America at Syracuse University before he became a pro. He was recruited to Syracuse by another great SU running back, Ernie Davis.